A man who needs women to prove his worth is a man who'll never be worthy. A Gentleman finds his worth in himself and his pride in a women. A gentleman is one who doesn't and cant forgive himself for self-committed mistake even if others forget it and the self-criticism is a mark of his right attitude towards life. To make a woman happy, give her these three things: Attention, Affection, and Appreciation. Never chase a man. A gentleman will do everything in his power to do the chasing and courting after the woman of his dreams. yea but really, what happened to all the guys like that these days? If you want to leave her, leave her breathless. If you want to lie, lie next to her. If you want to let go, let go of your pride and pursue her. The rhythm you set up, you abandon it. If you start with: "if you want to LEAVE HER", then, you have to say: "if you want to LIE TO HER" and "if you want to LET HER GO" -Sorry. You do! The convention you pick must be continued or your piece will be a FAIL. Be tougher on yourself, James. A gentleman respects every women in his life. If you can't respect your own mother, forget about respecting your girlfriend. A man who still hold bags, opens doors, tell their girlfriend she's beautiful and show respect. ARE REAL MEN! So don't these and the fakes mixed up. A guy who truly loves a girl, doesn't need to unbutton her shirt to get a better view of her heart. 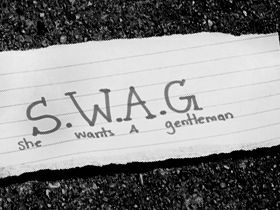 its to bad that its hard to find a gentleman out there that is only being a gentlemen to get into your pants. The word “gentleman” has its origin from the Latin word “gentilis” which means belonging to a race and man which is akin to the French word “gentilhomme.” Gentlemen are well-educated and civilised men belonging to noble families, possessing some sort of distinction. Gentlemen dress perfectly, speak eloquently and conduct themselves with great politeness in public. They have refined mannerisms and etiquettes and can be easily distinguished from the rest of the crowd. H.L. Mencken had once remarked, “A church is a place in which gentlemen that have never been to heaven brag about it to persons who will never get there.” Gentlemen are civilised males, who have had great upbringing and possess great qualities of mind and character. Their personality and voice differs from a male who has not been brought up in a similar environment. Guys in slums are uncivilised and lack the basic etiquettes.